Good evening viewers. This is Charlie Bodeh and welcome to a special report from KHQ-TV. As you may recall, last year there were rumours and reports emanating from California of an attempted infiltration and takeover of Earth by alien beings called Metalunans. The Metalunans supposedly came to Earth seeking uranium deposits as well as scientists to help them defend their planet in a war against another alien race called the Zahgons. You would also be aware that the primary source of this widely reported and far-fetched sounding incident came to us via two world-renown scientists, Dr Ruth Adams and Dr Cal Meacham who were apparently involved in this tale of what seems to be at first sight….. Science-fiction. Both scientists seem to have since gone to ground and their present whereabouts is unknown. 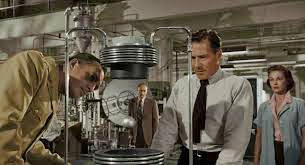 The most disturbing aspect of the whole incident is the disappearance and presumed murder of several highly acclaimed scientists who were said to have been forced to assist the Metalunans with their research involving atomic energy. Authorities in Washington are looking at a more Earth-bound cause of their likely fate, most likely involving…….certain foreign powers. 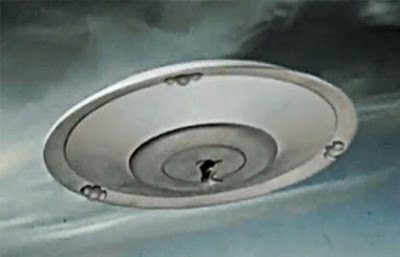 Hot on the heels of the “Metalunan Incident,” and as some would suggest is possibly related to it, come numerous reports we have received just this year alone of UFO sightings; from the skies of California to the rice paddies of Asia. These reports have come to us from a variety of sources ranging from air force pilots through to farmers and civilians. The authenticity of the pictures you are seeing on your screens has, however, yet to be determined. We now cross to Peter Gertres Freedman at Air Intelligence Command for the latest developments. Yes Charlie. As you can see, people have been streaming in to the authorities with stories of strange sightings of objects or UFOs in our skies. Although we can’t hear the people being interviewed, the common thread of the stories they have to tell is evident from the shocked and bewildered expressions on their faces, their fearful skyward glances and the circular aerial patterns they make in the air with their hands. Failure or inability to open, establish and maintain lines of communication. 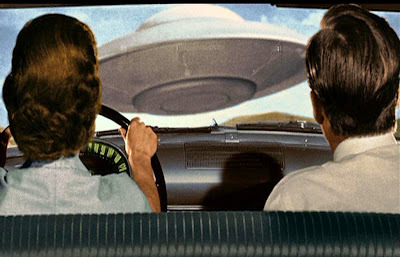 Suddenly out of nowhere and almost contemptuously, a flying saucer appears behind them, flies overhead and re-appears in front of the moving car. In defiance of Earth’s gravity and seemingly all the known laws of physics, the saucer accelerates upward and vanishes from sight in the twinkling of an eye. The nervous clutching for cigarettes and the tone of their voices gives away just how rattled they are by the experience…. 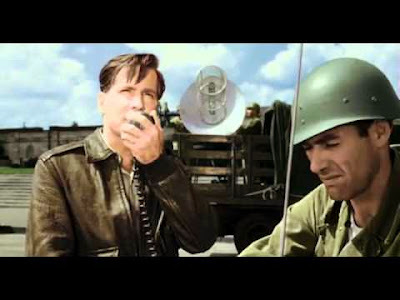 General Hanley, Carol's father, later informs Marvin that many of the satellites “apparently… blew up in outer space” and have crashed. In fact, they are now only in contact with “one bird.” The implication is that the satellites are being shot down as fast as they are sent up. It is not long before the Marvins witness the eleventh satellite falling from the sky after receiving a message that “they just lost contact with number 11.” Dr Marvin joins the dots and suggests that UFOs might be implicated in shooting the rockets down. 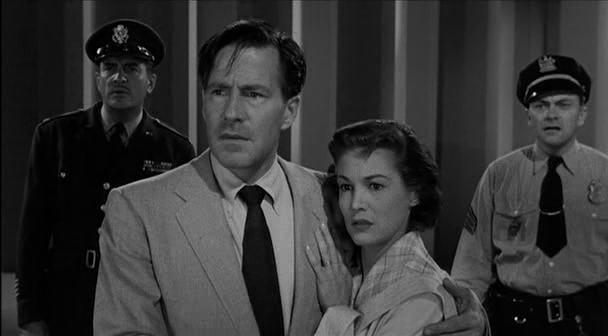 As if to reinforce Dr Marvin’s and the audience’s suspicions regarding UFO involvement in the destruction of the rockets, Russell, Carol and General Hanley witness glowing lights in the sky, These lights are explained as being “Foo Fighters” which were strange lights witnessed by WWII pilots that seemed to hover around and keep pace with their planes. The balls of light are also explained as being “St. Elmo’s Fire”, or plasma that is created by a coronal discharge from a sharp or pointed object such as a ship’s mast in a strong electric field in the atmosphere. As if on cue, the wreckage of rocket No. 11 enters the atmosphere and burns up. 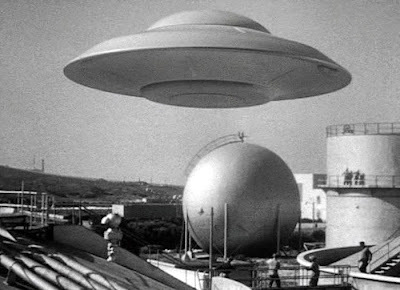 During the preparations for the launch, a UFO is seen overflying the rocket range before landing in the middle of the project facility. Three figures emerge from the craft but are soon fired upon by soldiers, who manage to kill one of the aliens. The aliens then retaliate with the destructive power of green rays. 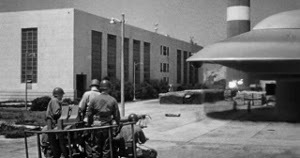 The aliens return with their fallen crewmate to their ship which is protected by a force field and they soon set about raining death and destruction down upon the rocket test facility, as well as taking General Hanley captive in their saucer. Policy of immediate recourse to violence and aggression (shoot first and ask questions later) leads to retaliation, violent response and escalation of conflict. 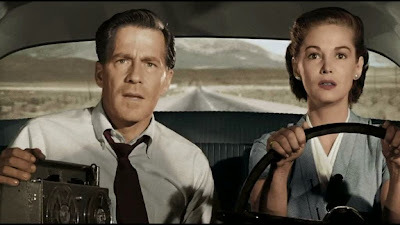 After the Marvins are rescued from their subterranean prison, they head to Washington to lay before the Internal Security Commission all that they have learned. Here they are met with scepticism. After all, all they have is a “strange voice, (and a) set of instructions (that) could’ve come from anywhere.” Caught between, on the one hand, a sense of urgency to act and on the other, a bureaucratic need to act only on authority and via a chain of command, Dr. Marvin is forbidden from making contact with the aliens. 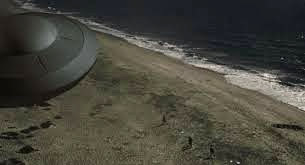 Impatient to conduct a meeting with the aliens, Marvin makes contact with them via shortwave on “225.6 megacycles as per instructions” and receives new instructions for a meeting at a beach on the Californian coast. As Marvin departs to meet the aliens, he is followed by Carol and his liaison watchdog, Major Huglin. All three are then followed by a motorcycle cop. 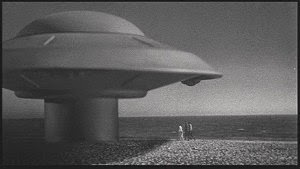 At the rendezvous point, the three tiny human figures are dwarfed by the enormous size of the landed saucer which serves to highlight just what it is they and humanity might be up against. Marvin approaches the ship and a voice explains that it is safe to enter. The aliens have extracted knowledge from General Hanley's brain, and now have him under their control. They are the last of their species. 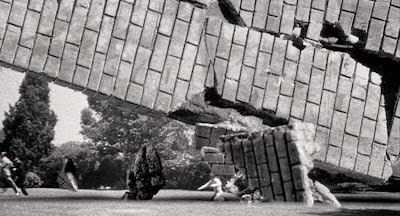 They are “the survivors of a disintegrated solar system” and need to find a new place to live. They destroyed the satellites not knowing that “they were primitive observation posts” and fearing they were weapons launched against them. They demand that Earth surrenders and let them control the planet or they will attack with their fleet if their demand is refused. They are willing to use their power, as evidenced by their destruction of a destroyer that fired on them, resulting in the deaths of 300 men. They wish to meet the world's leaders in 56 days in Washington, D.C., to negotiate a surrender and occupation. 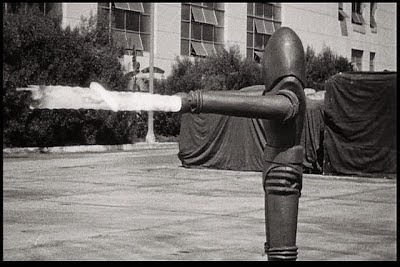 The humans are then released to convey the aliens’ message, all except General Hanley and the motorcycle cop who have been forced to endure the aliens’ “Infinitely Indexed Memory Bank” device, leaving them in a zombie-like state. Knowledge of others’ intentions and motivations needs to be determined in order to assess the likelihood of engaging in offensive or defensive action as being the only means of maintaining survival, life, liberty and way of life. Back in Washington, Dr Marvin comes up with an idea for a weapon “an ultrasonic gun” that uses sound to disable the UFOs causing them to crash. Despite some progress, it is soon determined that they don’t have the necessary tools or materials to make it work. An idea for a new weapon is later formulated which involves interrupting the saucers’ magnetic field with an intermittent electric field. During a final test of the new weapon, an alien spy drone is spotted observing proceedings, but is destroyed by the scientists. The aliens appear to possess intelligence about the new weapon and its location. An alien ship soon arrives just as the scientists evacuate the facility. 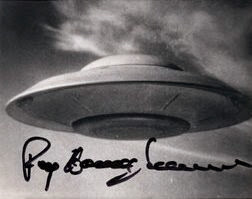 Marvin takes the opportunity to use the weapon on the saucer. The weapon works successfully with the saucer being driven off. However, one of the aliens has been left behind! 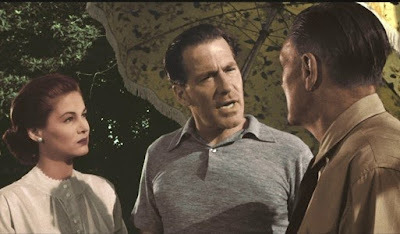 The callous and immoral nature of Earth’s interstellar enemy is highlighted by the killing of one of the scientists who walks with the aid of a walking stick and the almost petty and vindictive dumping of the motorcycle cop and General Hanley’s bodies from the saucer. Acts of barbarism and the committing of atrocities by one or both sides of the conflict is often a terrible consequence. Each side is often viewed as being sub-human and immoral by the other. Widely differing and irreconcilable perspectives, frames of reference and world views become evident. After the alien who had been left behind is killed by Major Huglin, they open the alien's suit to reveal a fragile atrophied corpse, “humanoid and ancient,” which quickly disintegrates. It is surmised that the suits act like an outer skin encasing the aliens’ atrophied muscles. Need for intelligence gathering about other side’s capabilities in order to combat them effectively. 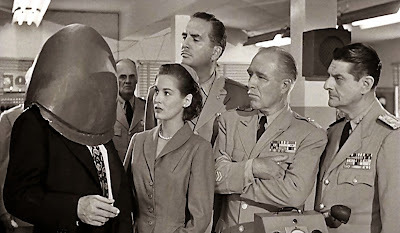 Later examination of the alien’s suit reveals a language translating device, which is used to interpret the aliens’ plan of attack. 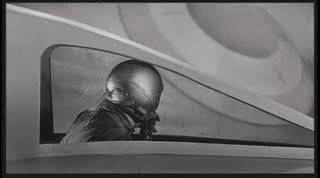 The helmet appears to be made from “solidified electricity” and it can amplify the senses of sight and hearing. Carol is asked to speak into the translating device and quotes the following phrase from a speech by Portia in William Shakespeare's play, The Merchant of Venice: “The quality of mercy is not strained. It droppeth as the gentle rain from heaven…” - A rebuff to the beings above for not demonstrating real mercy which is in their power to do. The one element that can prevent conflict and all that results from it is the “quality of mercy.” Mercy cannot be forced on anyone by the use of violence which only leads to death and destruction raining down on people. Trouble is to be expected when “Mercury is in perihelion” with the “Sun in Polaris.” In confirmation of this new intelligence, the aliens issue a worldwide broadcast beginning with: “PEOPLE OF EARTH. YOUR ATTENTION!...LOOK TO YOUR SUN FOR A WARNING!” In their broadcast the aliens threaten to affect the sun in order to cause global meteorological devastation in eight days. The aliens demand that all world leaders meet in Washington to discuss surrender terms. The consensus is that the aliens really intend to destroy Washington. When the predicted solar eruption takes place and with only nine days to prepare, there is the added problem of the ever worsening weather conditions. Understanding and exploiting the other side’s strengths and weaknesses. We have seen how the aliens’ power depends a lot on their own technology, in this case, the magnetic field they can generate. The humans were able to work out that it could be disrupted by an electrical force. For the humans, their strength also lies in the use of technology to live and the ability to use it to communicate. Reliance on technology is also their weakness as its disruption causes civilisation to virtually cease functioning and be at the mercy of whatever Nature (or an alien invader) has to throw at us. Imagine how vulnerable we in the 21st Century would be if power, communications, transportation and the internet ceased to work! “This is Charlie Bodeh from station KHQ-TV, speaking into this portable tape recorder and armed only with my two cameras. As my station is unable to transmit due to the ever increasing disruption caused by the weather and solar activity. I will endeavour to make a record of events for posterity even though I may lose my life in the process and the fate of humanity may be sealed this very day…. The eight days of climatic convulsions has caused massive delays in evacuating civilians, and there is still 60% of the population remaining in the city. The sound you can hear is sirens indicating that the alien attack has begun…..
“When an armed and threatening power lands in our capital, we don’t meet them with tea and cookies.” Those are the words of a high ranking military official I managed to speak with as the alien attack began…..That same official declared a bit later that the aliens are “contemptuous of our defences” as they managed to easily brush aside a combined aircraft and artillery assault…..
Three alien saucers have begun to assemble over our nation’s capital. I can see from my vantage point that the scientist, Dr Marvin is firing some kind of new electronic ultrasonic weapon. (Strange high-pitched sound) Yes, it worked! One of the alien saucers has been brought down! (Sound of loud explosions) As the artillery batteries are opening fire, I can see Dr Marvin moving his weapon to a new location……. Wait! 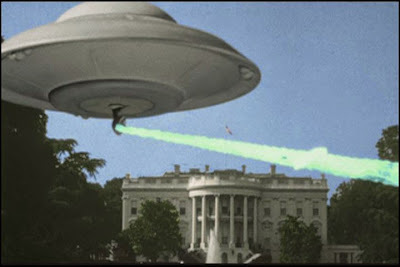 The alien saucers have now opened fire in the vicinity of the White House and Capitol building! (Sounds of explosions and screaming) Dr Marvin’s team is now making its way to defend the White House. I’m moving closer to better see what’s happening……. 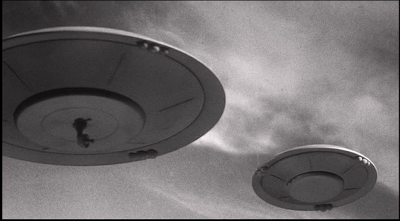 (Out of breath) One of the ray units has just been destroyed by the alien invaders and one of the saucers is landing. (Sound of gun fire) Soldiers are being deployed to combat the invaders…….. I have now re positioned myself just outside the Supreme Court building where the battle seems to have moved to. It is a scene of utter destruction with people having been killed by and trapped within the wreckage. 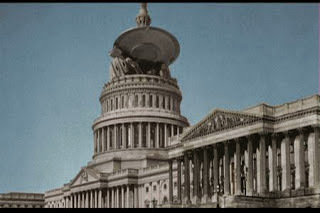 In a kind of ironic twist, a saucer has lodged itself within the building - our symbol of justice - as if the invader has finally had justice meted out to it for the unjust outrage it has tried to perpetrate on our planet……. 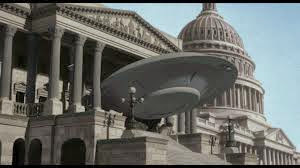 We have just received an emergency broadcast announcing that saucers are converging on the Capitol building! It appears the aliens are launching a final assault as can been heard from the cacophonous baying of the demented dogs of war let loose upon the centre of our nation’s power………. 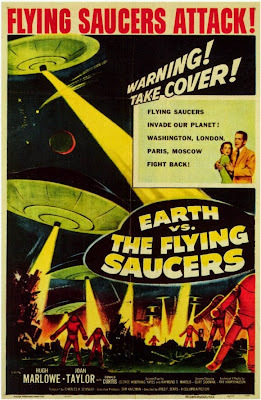 Although there are black and white films you certainly wouldn’t mess around with by colourizing them, Earth vs The Flying Saucers can be better enjoyed by viewing it in colour. 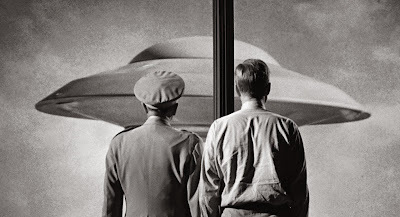 Although many of the scientific ideas in Earth vs The Flying Saucers may appear to be questionable, there are some interesting concepts that are worthy of consideration. Take for instance, the alien’s suit which serves as a protective exoskeleton. We have recently seen the development of exoskeleton-type devices with servo-mechanisms and actuators that are providing mobility for paraplegics and those with spinal injuries. The aliens in the film pointed out that they exist in a different time reference to our own. Given Einstein’s theories about space-time and debate about whether or not time can be considered to be absolute or linear, the alien’s comment does not seem so ridiculous. 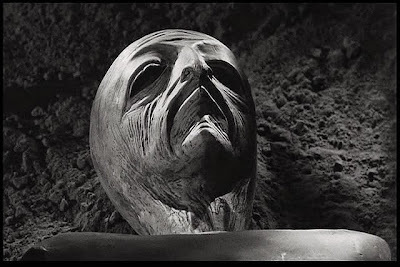 Read Edgar Rice Burrough’s, At The Earth’s Core (1914) and consider how time may or may not be perceived by the inhabitants of Pellucidar whose sun remains constantly overhead! 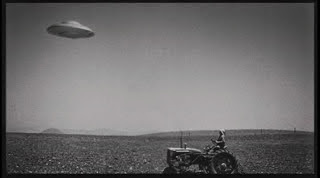 Notice that the aliens use a kind of drone technology to spy on the human scientists' activities. Such technology is pervasive in our modern times and is used by civilian hobbyists, farmers, certain activist groups and more worryingly by the military and spy agencies for surveillance and offensive operations. Drone technology has raised fears about the diminishing right to privacy and the "ethical" conduct of warfare. How long before it also becomes a regular feature of terrorist operations? “Classified high-altitude, long-duration flights of huge Skyhook balloons, which often returned their secret payloads to the surface, began in 1947 and continued for several decades. 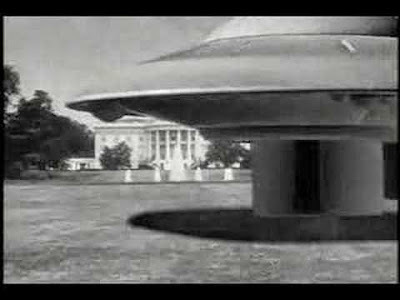 Some of the inspiration for Earth vs The Flying Saucers may have come from the rash of flying saucer sightings that took place over Washington over two weekends in July 1952. 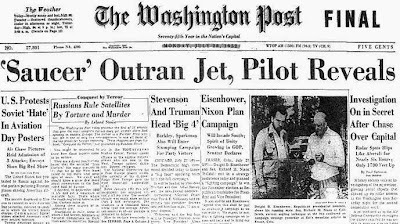 Commercial pilots radioed in accounts of mysterious lights that changed direction abruptly and travelled at fantastic speeds. These objects were able to effortlessly evade their pursuers, even at supersonic speeds. Was it all merely the result of “temperature inversion” or were we facing the possibility of interplanetary contact or…….war? 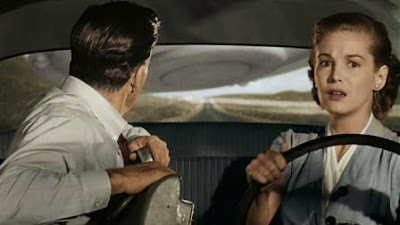 Harryhausen sought advice from well-known self-proclaimed and suspected paranoid UFO contactee, George Adamski on the way the flying saucers used in the film ought to be depicted. 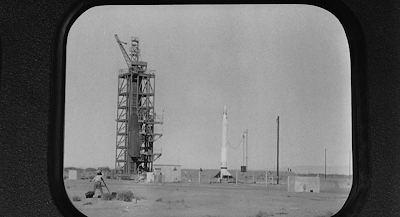 Stock footage was used in scenes showing gun batteries and missile launches. 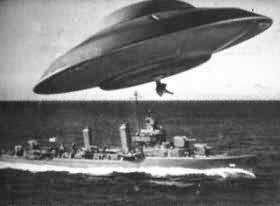 The destruction of the warship HMS Barham during World War II was used to depict the sinking of the U. S. Navy destroyer by a flying saucer. Viking rocket and German V-2 rocket launches were used to depict the satellite launches and launch failures. The voice of the aliens was produced from a recording of Paul Frees reading the lines and then manually manipulating the speed control of a reel-to-reel tape recorder causing it to alternate between a slow bass to a high and rapid voice. 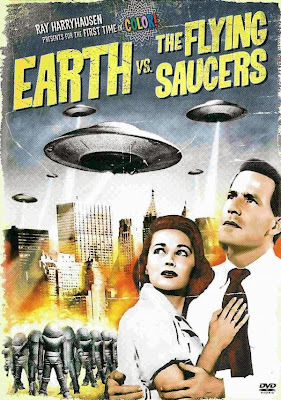 A film such as Earth Vs The Flying Saucers can have relevance to and resonate with today’s audiences who’ve witnessed the destruction of their nation’s landmarks and have seen the mayhem caused by acts of terrorism. This kind of fear has been lurking around for a long time and is not just a product of a mid-20th Century paranoid decade, nor a unique feature of our early 21st Century world. 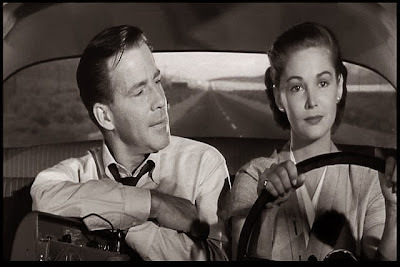 Also in tune with the film’s ideas is the fact that even now in the second decade of the 21st. Century, our long held feeling of distrust of government and suspicions of secrecy and conspiracy are gradually being replaced by acclaim for the authorities and the military as being our benign, benevolent protector and saviour. As in the film, the 21st Century version of the threat to our liberty and values is also seen as being imminent and coming from a hostile “enemy” that wishes to do “us” harm and whose ideology is alien to “us.” The only perceived solution: hypervigilance and war. 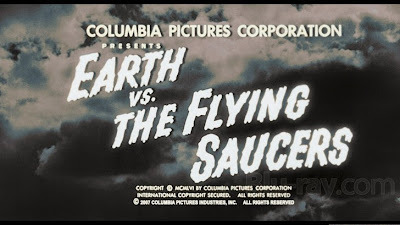 It’s well worthwhile to remember that at the time such films as Earth vs the Flying Saucers were being made, the “benevolent” US government was organising coups in Iran and Guatemala, exposing U.S. soldiers to life-threatening radiation in nuclear tests, giving mental patients LSD to research Chinese brainwashing techniques, and doing all it could to prevent its citizens from being well informed! Trust us and everything will be alright! Seriously? 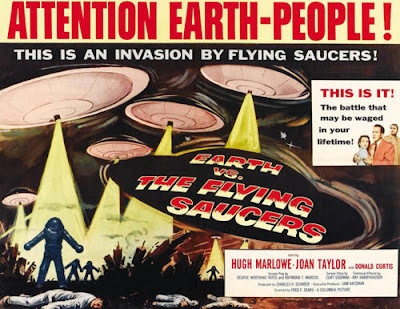 For us in the 21st Century, Earth vs the Flying Saucers and the era that created it serves as a reminder of the danger posed by a form of invasion that might not originate solely outside of our borders. The threat may lie closer to home whenever we wind up imagining and creating enemies to defend against. In addition, as we have seen above, the film also serves as a kind of guide as to the nature, causes and consequences of national, global, tribal, sectarian and military/political types of conflict.